The Best Garbage Disposal Repair in Queen Creek, AZ. One piece of equipment that is most often misused by a lot of people is the garbage disposal. It is designed to shred pieces of food into sizes that would comfortably pass through your home's plumbing system. A lot of people tend to forget that this appliance is constructed to handle light food residue and not huge chunks of trash. They give into the temptation to put huge pieces of food and residue that then clog their disposals and in turn the sink drains. Then they get annoyed when their kitchen sink refuses to drain or gets clogged. Even to those who do not misuse it, it can be quite frustrating when your garbage disposal starts misbehaving. It stays on, starts making noise and does not operate properly. A worse scenario is if you turn on the power switch and suddenly it shuts down by itself or you switch it on and it does not work at all. You know that you are in dire need of The Best Garbage Disposal Repair in Queen Creek, AZ. but you are at crossroads. 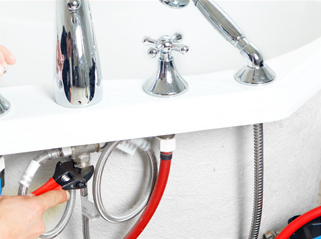 You do not know whether to try to fix the disposal on your own or call someone to do the dirty job for you. You then wonder what is going to happen to the entire food residue that you scraped from your plates and utensils. You start getting worried about the possibility of your kitchen being filled with a foul-smelling odor from the food stuck in the disposal. However, you do not need to worry for long; all you need do is contact a plumbing service that also engages in garbage disposal repair. They would unclog it and get rid of whatever seems to be the problem. Being professionals in this field, they would give you The Best Garbage Disposal Repair in Queen Creek, AZ. and have it working as good as new in no time. So, give us a call for an appointment today!